We don’t generally trade prior to earnings but both technical and fundamental factors are suggesting a long play on AAPL prior to the earnings announcement on July 22. Wall Street has been riding high on AAPL for some time now and expecting it to report $1.22 per share in earnings for Q3, Fiscal 2014, an increase of over 10% year-over-year. So, they’re making money. What else is new? From a fundamental perspective, the breaking news is Apple’s recent deal with IBM. This is huge from a revenue growth perspective. These long-time competitors are now teaming up to ride the tablet and app wave. According to Forrester research, business and governments (i.e. enterprise) spent approximately $11B on iPads alone in 2013. This is a significant amount for any industry but only accounts for a small portion (about a third) of the Cupertino giant’s total iPad sales. Furthermore, the $11B number is expected to increase by 20% over the next two years. The objective here is to get more users into the Apple ecosystem, which is the holy grail of the triple-play gods – computer, tablet, phone. Getting more users in the enterprise space to function with iPads will invariably cause more demand for complimentary products such as iPhones, Macs and associated apps, music services and the list goes on. The deal with IBM clearly allows Apple to gain a stronger foothold in the enterprise space. A secondary and, sometimes overlooked benefit, is that they are now in business with the company that is the gold standard in enterprise and they did it before Google (GOOG) could manoeuvre into that space with its Android offerings. The consumer space for iphone and other i-products is getting saturated but the enterprise space is still fertile ground. Thus, with Apple showing signs of growth even in the relatively sleepy consumer space, its outlook only looks better over the next 6 – 12 months as it rolls out its initiatives in the enterprise space. On June 9th of this year, Apple’s stock started trading post 7-1 split. Even though the company’s stock isn’t really any cheaper based on the way Wall Street analysts value stocks, the stock is undoubtedly more affordable. From a technical perspective, the news is even more exciting as AAPL is coming off a three day pullback to its 20 day simple moving average and looking to bounce. 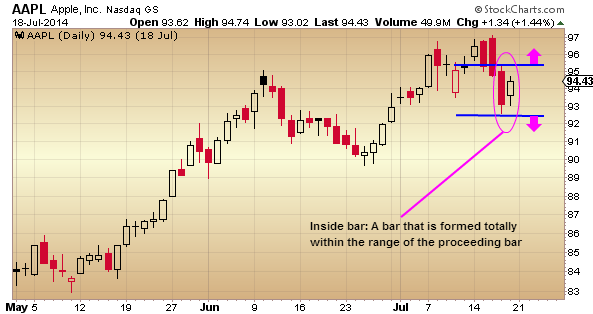 The daily chart has also formed an Inside Bar formation which could be a catalyst for a move upward. An inside bar is a bar (or a series of bars) that formed totally within the range of the proceeding bar (see chart below). An inside bar indicates a time of indecision or consolidation. Inside bar formations usually occur after a market makes a large directional move and can also occur at turning points or key areas of support or resistance. See full video tutorial here. There are two ways to trade an inside bar formation: As a continuation signal or as a reversal signal. When faced with an inside bar setup, traders should be looking to trade a breakout. Meaning, they should be looking to go long (buy) if the high of the previous (larger) candle is broken or go short (sell) if the low of the previous (larger) candle is broken. In this particular case, since AAPL is clearly in a strong uptrend, we would only be interested in trading AAPL to the long side. If it trades above $95.28 (the high of last Thursday’s candle), we would consider it a strong entry point for a long position. This trade was first identified through one of our proprietary scanning systems which is free and can be learned here.